The big red comic book hero with demonic origins gets another outing on the big screen. 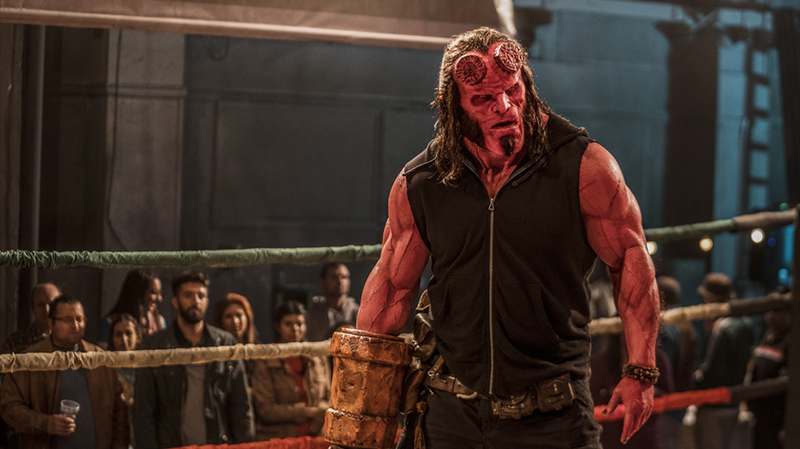 This time director Neil Marshall (The Descent) brings Mike Mignola’s creation to life in this latest reboot of Hellboy. As an agent of the B.P.R.D. (the Bureau of Paranormal Research and Defence) Hellboy (David Harbour) is tasked with keeping the world safe from the threat of the supernatural and otherworldly. When he is invited to England, to join in a hunt for a trio of rampaging giants, Hellboy becomes aware of a greater threat to the world. With the help of the medium Alice Monaghan (Sasha Lane), the oddly afflicted soldier Ben Daimio (Daniel Dae Kim), and his own adopted father (Ian McShane), Hellboy must stop the pieces of Nimue the Blood Queen (Milla Jovovich) from being reassembled, and bringing about the end of humanity. How can you not love a film that starts with a vampiric luchadore… and yet here we are. Despite the decades of comic lore to draw upon, Marshal decides to tell extensively the same tale as Guillermo del Toro’s 2004 version. Sure the agents of the apocalypse have slightly changed, but it works on a very similar narrative thread to the previous Hellboy character arc. Hence it invites comparisons as a film, and this version is distinctly lacking any degree of subtlety and substance. That in and of itself is not unforgivable, as leaning into the pulpish origins of the character could have worked, by stripping the plot back and leaning into the action. Unfortunately Marshall tries to have a pound both ways, by making it an overly stylised action piece, but also by throwing multiple elements of the lore into play (drawing from Darkness Calls, The Wild Hunt, and The Storm and The Fury arcs of the comic, and even managing to toss in some Lobster Johnson for good measure). With none of these developed, the numerous extraneous plot elements just drag down the whole, leaving less of a demoniacally princely film, and more of a bloated corpse – messy, and full of hot air. However, it’s hard to entirely dismiss Marshall as an action director. The man that brought you the Battle of the Blackwater (Game of Thrones), obviously knows how to stage a set piece, and although they are not stunningly original, there is still a sense of gory visceral fun here. David Harbour (Stranger Things) has a great turn under the red latex to bring the devilish paranormal hunter to life. Even saddled with a poor script, Harbour’s Hellboy comes across as a foul-tempered and churlish teen, trapped in the body of an abyssal creature, chaffing against the constraints of his father figure – exactly as the character is in the comics. By contrast, the usually solid Ian McShane (Deadwood) has a bit of a patchy performance. For the most part, he’s great, but so obviously uncomfortable with the special effects of one key sequence, that he delivers the lines with all the passion of a read through. Given how important that one sequence is in terms of the narrative, it brings down the rest of his work in the film. At the end of the day, this doesn’t mean a lot, when the story and script is so woefully inept. Hellboy is unable to infuse audiences with enough of a sense of excitement to get through the needlessly overstuffed tale it is working with. Hence for all the blood, all the violence, and all the action (it really does deserve its R classification), Hellboy never offers anything more, feeling instead like an exercise in self-aggrandising that never convinces you of its actual worth.